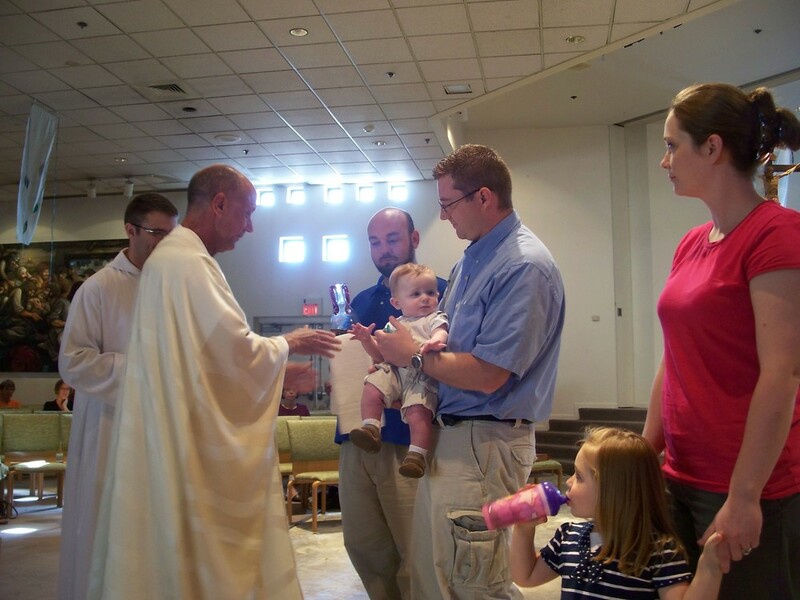 Infant Baptism is celebrated for children from birth to age 7. For more information please contact Pamela at Baptism@StBridget.org or call 480-924-9111. Children over age 7 who need baptism participate in the Family Sacramental Preparation program, which begins every January. Contact Diana Rosales, Faith Formation Facilitator for more information: faithformation@stbridget.org or 480-924-9111 x305. Adults and Teens who have not been baptized in a trinitarian faith tradition are invited to join the Catholic Church through a process known as the RCIA (Rite of Christian Initiation) for Adults and Teens. Contact Brian Jorgensen for more information: parishlife@stbridget.org or 480-924-9111 x301. Parents should understand that presenting their child for Baptism is a promise to faithfully raise their child in the Catholic faith, and to be an example of Christian living for their child. The parents who are Catholic are expected to be practicing Catholics. This means being registered in a parish, giving of their time, talent, and treasure in support of their parish. Parents must attend a Baptism Preparation class within 2 years prior to this baptism. Expectant parents are encouraged to attend the Baptism Class before the birth of their child. Parents must reside in Saint Bridget Roman Catholic Parish (SBRCP) boundaries, or be registered in SBRCP. Parents who do not reside in SBRCP boundaries, or are not registered at SBRCP must provide verification of registration in another parish signed by the Pastor of that parish with church seal, and returned by the Pastor to SBRCP prior to scheduling a Baptism. Their Pastor must also give permission for the Baptism to be celebrated at SBRCP. Your children are welcome to attend the class with you. Childcare is offered during these classes. Godparents are Catholics in good standing who are registered in a parish, attend Mass, and are giving of their time, talent, and treasure to their parish. A Godparent MUST be a confirmed Catholic and practicing their Catholic faith. If the person is a non-Catholic, they are a Christian Witness. A Christian Witness is not required to attend a Baptism Class or provide verifications. One Godparent is required, but you may have two. If there are two Catholic godparents, they must be one male and one female. Godparent(s) are to be at least 16 years old and confirmed, and not co-habitating. Married Godparents must be in a valid Catholic marriage, that is, married by a priest or deacon in the Catholic church, or have had the marriage validated, or had a dispensation from the local Bishop to be married in the church of another faith tradition. Godparents are to complete a “Godparent Certificate”, which must be signed by the Pastor of their home parish with the church seal, and returned to our Parish Office before a Baptism will be scheduled.